Almost everyone at some point makes changes in their lives. Whether you are moving on and leaving home for the first time, graduating from school and saying goodbye to your friends, breaking up with a significant other or leaving a job, at some point you are going to have to make a break with your past in some way. Moving on and making life changes can be painful and difficult, but it can also be exciting. No matter what your circumstances, some quotes about moving on will help you to find solace in the fact that others have also experienced what you are feeling. The following quotes about moving on have been collected from information around the Internet. 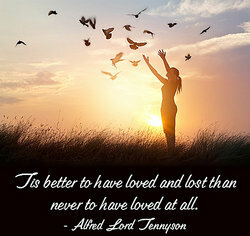 The quotes are those that have become well known and well loved by people looking for words of wisdom when moving on. So, now you have a lot of different quotes about moving on and hopefully some of them will help you in your own situation. "Quotes About Moving On." YourDictionary, n.d. Web. 20 April 2019. <https://quotes.yourdictionary.com/articles/quotes-about-moving-on.html>.